Parts of America’s Deep South are in the middle of some out-of-control flooding, and the waters are continuing to rise. The Weather Channel reports that 30 inches of rain fell in the town of Watson, La., which is in the Baton Rouge metropolitan area, and that number is expected to climb. NASA’s Global Precipitation Measurement (GPM) satellite measured that at one point Thursday night, rain was falling at a rate of 3.9 inches per hour. This is quite a lot considering it only takes around two feet of rain to drag cars away. 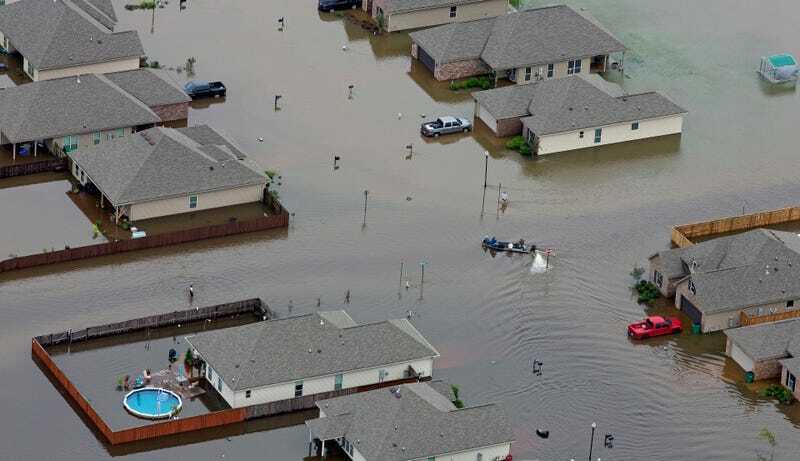 “From the air homes in southwest Louisiana looked more like little islands surrounded by flooded fields. Farmland was covered, streets descended into impassable pools of water, shopping centers were inundated with only roofs of cars peeking above the water. At least six rivers have risen to record levels. The Amite River, for example, exceeded its previous record by over six feet in one area. The Louisiana and Mississippi governors have both issued states of emergency, although only a few counties in Mississippi are affected. So far, around 2,000 people have been rescued from homes, cars, and other buildings. Three deaths have been blamed on the flooding and one person is still unaccounted for. This is all due to a low pressure center that was over the Gulf of Mexico, sending heavy rain over southeastern Louisiana and parts of Mississippi. Forecasters are expecting the rain to ease up Sunday as it moves north, but warn that some areas could be seeing heavy rain for the rest of the week. Did the Apocalypse Just Start?